The Diabolo is an excellent e-kit alternative which perfectly partners the TD-9 drum module. Whether you feel it's worth the extra cash for 'real' drum aesthetics will be down to taste and pocket. German e-drum specialist Drum-Tec is an all-in-one electronic drum solution: distributor, dealer, designer and manufacturer. It retails a sizeable selection of products from some of the world's top manufacturers including Roland, Yamaha, Hart Dynamics and KAT. 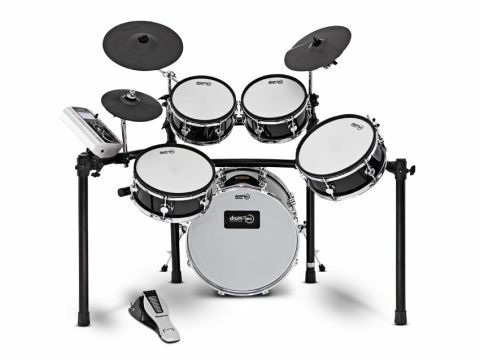 Drum-Tec also produces its own brand of electronic drums that, in a similar vein to Pearl's E-Pro Live, is an amalgamation of acoustic drums with electronics. "Within a few strikes upon the well-tensioned heads, it becomes evident this could be an enjoyable drumming experience"
The top of the range Drum-Tec 'Pro Series' employs full-sized shells with a beautiful sapeli wood exterior and conventional hardware, while the slightly more affordable 'Diabolo Series' features a compact design with shallow depth toms and a drum rack. There are two basic variants of the Diabolo; a five-piece Rock set-up (as in the review set), with three toms, or the four-piece Jazz (which includes Roland's VH-11 hi-hat), but with two toms. To partner the Diabolo, Drum-Tec has included the excellent TD-9 drum module featuring Roland's proprietary V-Drum technology - this is a really powerful module that could fill a good few articles with its features. Also included with the kit are many other Roland components (chosen for their reliability and durability), including three cymbal pads, hi-hat controller pedal, drum rack and cabling. Except for a discreet ¼" jack socket and the shallow depth toms, the Diabolo looks just like any other acoustic model - especially with the nicely proportioned bass drum. The actual shells are manufactured in Taiwan (under Drum-Tec's close supervision), featuring a ply construction with a 45° bearing edge. Once finished in a Piano Black lacquer, the drums are shipped over to Germany to be fully assembled with precision laser-cut trigger electronics and standard tuning components. The finished shells feature rounded (mini Hayman/DW-style) nut boxes, standard square-headed tension bolts and triple flanged hoops. Helping to maintain Drum-Tec's 'super-silent' philosophy, the top hoops are each fitted with a dense rubber ring and Drum-Tec's own design mesh heads. The batters (top heads) are twin-ply, said to give a realistic playing response while being virtually inaudible. Taking the 'silent' approach a little further is a specially-designed 'tennis ball' bass drum beater that cuts down on the low-end thud normally associated with the kick pedal on electronic kits. The triggering system is a feat of German engineering in itself, with two centralised metal plates (one directly mounted above the other), suspended by three adjustable hexagonal rods. Each metal plate carries a single electro-static transducer - while operating in tandem, the lower one transmits the strikes from the rim to drum edge and the second (isolated by a dense foam cone) comes in direct contact with the batter head, transmitting the strikes around the centre of the drum. Each of the Roland cymbal pads (including the hi-hat) has the facility to choke (immediately halt) the cymbal sound, while the ride has additional attributes such as bell/bow and edge triggering. To add to the realism, the hi-hat controller has a totally 'smooth transition between open and closed', which gives it the facility to half 'open' the hi-hat and all the usual hi-hat tricks. Out of its box, the Roland rack and individual drums each come ready-assembled, so it's simply a matter of opening up the two rack arms, attaching each drum/cymbal pad, placing the bass drum in position and cabling up. The set-up is a particularly rapid process thanks to the combination of the speedy DB-25 'plug and play' connector, well-engineered components and the strong desire to give this little lot a jolly good bashing! Within a few strikes upon the well-tensioned heads, it becomes evident this could be an enjoyable drumming experience - and soon we find ourselves fully immersed in the great sound of the module and the feel of the drums/pads. The playing surface gives the sticks a sort of trampoline effect initially being close to losing control (owing to the accelerated stick response). Luckily the dodgy technique quickly adjusts and soon some wicked double strokes manifest themselves. It is not only the rapid-fire strikes that come willingly; it is also possible to act with regal restraint, squeezing every delicate ghost note and subtle nuance from the kit. Though the wrists have been in for an enjoyable playing treat, our feet could hardly be envious with such a warm and positive response from the bass drum. It seems as if my double pedal has been awarded with some magical rocket power that, at times, seems hard to comprehend. Luckily Roland's TD-9 brain copes well under the pressure taking the trigger-happy, incessant performance with ease.